A suitable combination of colors is one of the main components of a perfect look and a stylish interior design. Precisely for this Genial.guru decided to share with you a guide that will help you not go wrong when it comes to choose clothes and create design in your home. Complementary, additional or contrasts, colors are those which are located on opposite sides of the color wheel Itten. Combination looks very lively and full of energy, especially if the colors saturated hues are combined. It is the combination of three colors that are located at the same distance from each other.Such a combination provides a high contrast without interfering with harmony. This combination looks lively enough even if pale colors are chosen and little saturated. It is the combination of 2 to 5 colors located next to each other on the color wheel (ideally combine 2 to 3 colors at once). This set of colors gives a quiet and pleasant impression. An example of the analog color scheme “off” would be: teal orange, yellow, green yellow, and green. It is a variation of the complementary combination, but rather the opposite color the two colors are used next to him. This combination is used for a base color and two additional colors. The scheme looks almost as contrasting as tense. If you’re not sure you can use either the complementary combination, the complementary combination used separately. 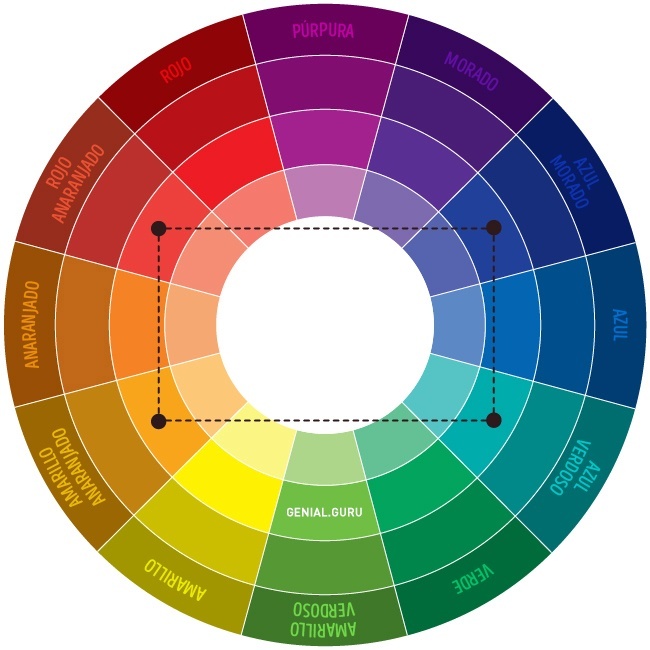 This color scheme comprising a basic color, two additional and another that puts accents.An example: teal, purple blue, orange red, orange yellow. It is the combination of 4 colors that are the same distance from each other. The colors do not look at tone, but in any case are complementary. This type of combination allows you to create a dynamic, playful and eye-catching style. Example: purple, orange red, yellow, cyan. White: with everything. The best combination is achieved with blue, red and black. Beige: blue, coffee, emerald, black, red and white. Gray: fuchsia, red, purple, pink and blue. Rosa: coffee, white, mint green, olive, gray, turquoise and blue. Fuchsia (dark pink): gray, yellow, brown, lime green, mint green and brown. Red: with yellow, white, brown, green, blue and black. Red Tomato: blue, mint green, sand, creamy white and gray. Cherry red: blue, gray, light orange, sand, brown and beige yellow. Red Raspberry: white, black and pink Damascus. Coffee: strong blue, cream, pink, light green and beige yellow. Light Brown: light yellow, cream, blue, green, purple and red white. Dark Brown: lemon, blue, mint green, purple pink and lime. reddish brown: pink, dark brown, blue, green and purple. Orange: blue sky, blue, lilac, violet, white and black. Light orange: gray, brown and olive. Dark orange: brown yellow, olive, brown and cherry. Yellow: blue, purple, black light blue, violet, gray and black. Lemon: cherry red, brown, blue and gray. brown yellow: pink, gray, brown, shades of red, amarrillento coffee, blue and purple. golden yellow: gray, brown, sky blue, red and black. olive color: orange, tan and brown. Green: golden brown, orange, yellow-green, yellow, brown, gray, cream, black and creamy white. yellow-green coffee, yellowish brown, brownish yellow, gray, dark blue, red and gray. Turquoise: pink, cherry red, yellow, brown, tan and dark purple. electric blue: golden yellow, brown, light brown, gray and silver. Blue: red, gray, brown, orange, pink, white and yellow. Dark blue: clear, blue, yellow-green, brown, gray, brown, yellow, orange, green, red and white lilac. Lila: orange, pink, dark purple, olive, gray, yellow and white. Dark purple: golden brown, yellow-brown, gray, turquoise, mint green and pale orange. The black color is universal, looks good in all combinations, especially with orange, pink, yellow-green, white, red, purple and yellow.